If you would like to keep your home warm and safe, it is important to clean your chimney on a regular basis. To reduce the chances of getting carbon monoxide poisoning and a fire breakout, it is essential to have your chimney cleaned by a competent professional. Moreover, some home insurance companies will be unwilling to pay for fire chimney damage unless you can show them a certificate to prove that your chimney has been swept and maintained by a certified chimney sweep in Marietta, GA.
Our professionals have been educated and trained on how to inspect and clean your chimney. They are able to offer recommendations for the repair work that needs to be done. The Marietta, GA chimney sweep professional you will work with understands the complexities of dealing with chimneys and venting systems in the home. 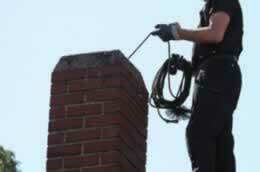 We have been doing chimney cleaning in Marietta, GA for many years. We have been offering our clients a fast, affordable, prompt and reliable service. We use quality products and strive to exceed customer expectations since we want all our customers to be 100% satisfied. Reliable – We have been here for years and will continue serving Marietta, GA residents for many years to come, so you can always call on us whenever you need a chimney sweep in Marietta, GA. We will make sure that the job gets done and be on the lookout for any issues that your chimney might have, which you as a homeowner might easily overlook.